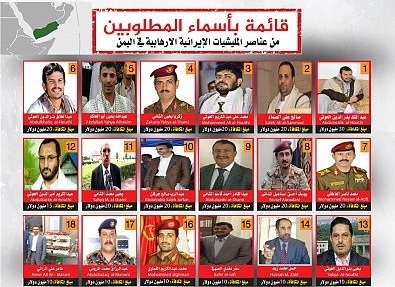 RIYADH: The kingdom of Saudi Arabia on Monday announced a list of 40 names of leaders and elements responsible for planning, executing and supporting various terrorist activities by the Al Houthi militant group, as well as financial rewards (shown against each name), for information leading to their arrest or whereabouts. "Based on the Anti-Terrorism Regulation and Financing and the Interior Ministry's statement issued on 6/5/1435H regarding the first list of terrorist parties, groups and movements, including the Houthi group. "In light of the Kingdom's commitments to combat terrorism, dry up its sources of financing, fight extremist ideology and tools of its publication and promotion and its continuous action to eradicate it and protect the society from it and based on the dedicated increasing of terrorist activity by Houthi group and their continuous endeavor to harm the Kingdom's security with support of the Iranian regime (the sponsor of the all terrorist organisations in the region) and detected bolstering the Houthi terrorist group's cooperation with the Lebanese Hezbollah terrorist organisation within framework of exchanging expertise and enhancing military capabilities among these terrorist organisations and the use of ballistic missiles in a grave precedent in which these dangerous missiles are made available to these rogue terrorist organisations in a direct threat to the Kingdom's cities which aims at terrorising the innocent and harming the Kingdom's security, stability, tranquility and public order, the Kingdom announces the first list of 40 names of leaders and elements responsible for planning, implementing and supporting the Houthi terrorist group's various terrorist activities. "The Kingdom also announces financial rewards (stated in front of each name of them) to any one providing information leading their arrest or locating them. It urges those who own information to contact competent authorities in the Kingdom through the stated safe communication mechanisms which have been designed to protect the secrecy of provided information and the identity of the its providers. 40- Ali Nasir Qarshah ( amount of reward: $5 million).